Ethereum is an unprecedented arena for playing cooperative games. Ethereum enables powerful economic vehicles we don’t yet understand. Non-cooperative game theory, the original and most widely used branch of game theory, assumes the absence of an external authority to enforce rules. Fundamentally, I claim that the Ethereum ledger constitutes an incorruptible, omnipresent, external overseer that no matter the game is always available to enforce agreements among players. This implies that Ethereum, in theory, could turn any non-cooperative game into a cooperative game (sometimes called a coalitional game). The transmogrification from non-cooperative to cooperative games is achieved by a technique we term Game Warping defined as using transparent, triggerable, unstoppable burns and on-chain side-payments to move game-theoretic equilibria or to create new player actions. Game Warping stacks as a new layer atop an uncooperative game to make cooperation the Rational choice. The most well-known problem in game theory is the Prisoner’s Dilemma—it is the quintessential example of a non-cooperative game in which the Rational strategy puts players into the worst possible state. Under Ethereum, I kid you not, the Prisoner’s Dilemma becomes a cooperative game. Say players A and B want to do something naughty. But before they commit their crime, they each deposit one million dollars (valued at 1000 utility points) into a smart-contract which states, “If I publish a defect message, my million dollars gets destroyed.” Now that the smart-contract is in place, as long as the police don’t offer more than a million dollars to defect, Rational prisoners will choose to cooperate. Game Warping the Prisoner’s Dilemma. Green denotes Nash equilibria. For inspiration, this list of situations matching the Prisoner’s Dilemma includes: carbon-emissions, sports doping, tragedy of the commons, and international weapons buildup. Could Ethereum have something to offer these areas? It seems plausible. The Stag Hunt is a canonical model of cooperation. The game posits two hunters choosing to hunt either Stag or Rabbit. The greatest pay-off is when both players hunt Stag (successfully hunting stag requires both hunters working together). But hunting stag is also the riskier strategy because if the other hunter goes Rabbit, the hunter who went Stag gets nothing — the safer option is the guaranteed pay-off from hunting rabbit. The desired warping is the same as the Prisoner’s Dilemma. Each hunter deposits a large sum (worth 1000 utility points), that is burned if the hunter hunts Rabbit. Game Warping the Stag Hunt. Green denotes Nash equilibria. Outcome is the same as in Prisoner’s Dilemma and cooperation is now the sole equilibrium. After warping, Rational hunters will now consistently choose Stag. There exist variations extensions of Stag Hunt to make the game more realistic, but the warp to turn it cooperative can always be done. Player A publicly warps his own actions to force player B into a choice between -1 utility for Swerve or -100 for Straight. Acting Rationally, Player B chooses to Swerve, and player A gains the reward. Chicken has two equilibria: [Straight,Swerve] and [Swerve,Straight]. But after the warp, the only remaining equilibrium is [Straight,Swerve], netting you (player A) the maximum pay-off. In an Ethereum world, Chicken becomes a race for who can first publicly toss out one’s own steering wheel. Not limited to profiting from warping one’s own games, one can even profit by threatening to warp games you’re not even party to. Such extortion is obviously not endorsed, but we include it as a ramification of smart-contract technology. Consider the situation from this paper from Bono & Wolpert, where a third player C knows players A and B are about to play a game (and their pay-off matrix). With Ethereum, C can create a smart-contract in clear view of players A and B. This newly created contract states that unless A pays the contract, the contract will send a large payment to B conditional on B performing a rivalrous action against A. In essence, player C is extorting player A by credibly threatening to incentivize B to act rivalrous against A. More concretely, consider the case below. 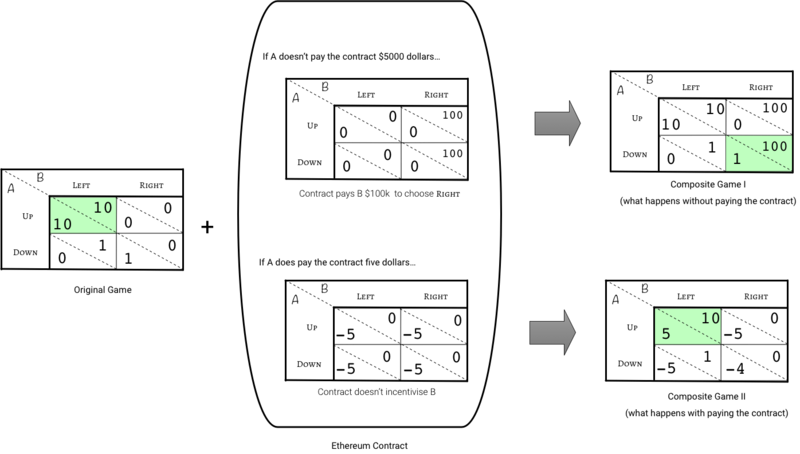 Player A has actions Up/Down and player B has actions Left/Right. Initially, they both so desperately desire to occupy (Up, Left) in a very positive-sum interaction of ten utility points. However, an external player C recognizes the game about to be played and instantiates a smart-contract to extort $5000 (worth 5 utility points) from player A. If A does not pay the contract, the contract will pay B a hefty $100,000 (worth 100 utility points) to choose Right. Once Player A sees the smart-contract, A is faced with the choice between two worse options — Composite Game I or Composite Game II. Unfortunately for player A, the Rational choice is Composite Game II, and A pays the extortion fee. Contract extorting A to pay money so that the contract will refrain from incentivizing B to always go Right. Green denotes Nash equilibria. This game-warp is equivalent to the infamous p+epsilon attack. One of the most surprising aspects of game-warping is that someone making a credible promise to pay can change the Rational strategy (and thus often the outcome of the game) without ever actually having to pay — if everyone plays Rationally, the game can be influenced for free! Caveat. Ethereum payments and burns can only be triggered by an on-chain event. This is clearly a limitation — for example, in the prisoner’s dilemma, if a prisoner could defect without it being broadcast on-chain, the player sidesteps the million-dollar burn. The relevance of side-channel (off-chain) communication will vary case-by-case. But the fewer off-chain interactions between players, the more likely the game can be successfully warped. The biggest contributions to this area will be discovering the exact property that games must have to ensure the player actions being warped will always be broadcast on-chain. An additional caveat is that, for game-warping to succeed for individual gain, the recipient players must discover the warp has been performed; more precisely, the warp must become common knowledge. This limitation on anti-social contracts may turn out to be a blessing. What does Ethereum change? Technically speaking, game-warping doesn’t require smart-contracts. However, an obvious niche for Ethereum smart-contracts is for cases when, due to your jurisdiction or subject matter, reliably impartial judges are hard to find. Beyond these niches, Ethereum (or another smart-contract platform) makes all game-warping vastly more practical by providing a deterministic, all-seeing, cheap, and expedient (!) judge. Go through a classic game-theory textbook. Enumerate all of the common non-cooperative games. See for how many of those games cooperation could, via conditional payouts or deposit burns, yield a superior equilibrium than the original Nash equilibria. Discover prominent industries where these games appear. Submit a startup proposal to become a ConsenSys spoke. Special thanks to Georgios, vi, and Dan for our joint research developing game-warping and feedback on drafts. Thanks to Daniel Moroz and Ying Tong.